About – Women In Jazz Association, Inc.
Women in Jazz Association, Inc. was founded by Pamela and Kevin Hart to provide Women in Jazz Concert Series and Vocal Performance Workshops for performance opportunities and experiences of professional and amateur jazz vocalists in the Austin metropolitan area. Women in Jazz Association, Inc. is a 501(c)(3) tax-exempt organization. The Board of Director currently consists of Pamela Hart, Kevin Hart, Charelesa Russell, Dwayne Jones, Anitra Jones, and Tommy Johnson. Austin, Texas, “the live music capital of the world,” can boast of very little live music that includes jazz vocals. 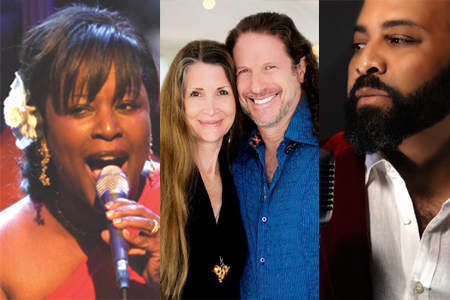 Since the venues in Austin that consistently provide jazz music book vocalists much less than other musicians, jazz vocalists create their own entertainment venues in Austin. Women in Jazz Concert Series is the outgrowth of the need for a performance venue for women jazz vocalists. The purpose of Women in Jazz Association is to perpetuate the appreciation and performance of traditional jazz vocal and instrumental music. As vocal jazz is a declining art form, this purpose is charitable — the protection and preservation of a valuable art form called jazz; that is, vocal jazz. It is through concerts, educational workshops, and performance opportunities of singers that provide the means to the end — perpetuate vocal jazz music. Provide a performance space for live jazz concerts. Provide a jazz music library and an internet site for jazz publications and music. To provide professional development in the performance and music industry to female vocalists. Since 1994, the Women in Jazz Concert Series consists of two concerts and a workshop. Each year, the producers of Women in Jazz attempt to enhance some aspect of the series. From 1994 to 1995, the concert’s venue moved from Antone’s Nite Club to the Live Oak Theater at the State. In 1997, the historic Victory Grill was added as a venue for the concert series. The Paramount Theatre has been the scene of some of the concerts, particularly when a big name national act such as Dianne Reeves, Nancy Wilson, Rachelle Ferrell, and the Rushen-Carrington Quartet have been presented (through 2007). The workshop teaches non-professional vocalists practical performance techniques, demonstrate verbal and nonverbal cues to communicate to musicians, prepare mentally and physically for a performance, and continue to learn more about making it as a professional vocalists in the music industry. It is important that Women in Jazz Association develops to its potential. As long as there is growth and development in the Austin metropolitan area in general, there is potential growth and development of the Women in Jazz project, for there is a greater audience potential, a greater demand for diversity and professionalism of its performers, and a greater potential for project funding sources. Project managers are proactive in keeping pace with Austin’s changing society, and they attempt to keep the Women in Jazz Concert Series in line with societal demands. increasing the series from one weekend per year to two weekends per year. Donate your tax-deductible contribution to Women in Jazz Association, Inc. to help fund Youth Programs, Concert Series and Workshops.